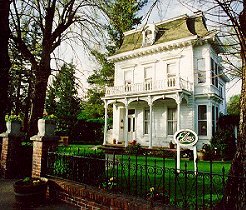 Napa Valley's most romantic B & B, built 1871 and on the National Register of Historic Places, is the last of the "Great Eight" homes of Calistoga. Quiet downtown location next to a park in walking distance to spas, restaurants and shops. The Elms offers comfort of an elegant and intimate French Victorian Home and a convenient location to explore the Wine Country. Bycicling, Tennis, Golf, Horseback Riding nearby. Elaborate Gourmet Breakfasts, complimentary wine and cheese, port and chocolates in the rooms complete the ambience. All 7 guestrooms / Honeymoon Cottage - with many Personal touches and antiques - have private baths (4 w/jacuzzi) , A/C, TV, down comforters/featherbeds, bathrobes, coffee makers. Most have fireplaces. Rates: Rates: $145-$245; please ask us about our mid-winter rates. - Gift Certificates available - Prepayment required. MC, Visa, personal checks. - 7 days cancellation notice - In consideration of others, no smoking.